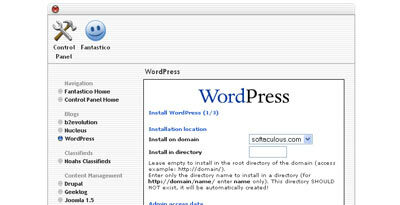 If you want to have your WordPress installation in its own subdirectory on your website (e.g.http://example.com/blog/), create the blog directory on your server and upload the contents of the unzipped WordPress package to the directory via FTP. The WordPress package will extract into a folder called wordpress in the same directory that you downloadedlatest.tar.gz. You can either create and edit the wp-config.php file yourself, or you can skip this step and let WordPress try to do this itselfwhen you run the installation script (step 5) (you'll still need to tell WordPress your database information). If your files are already on your web server, and you are using shell access to install WordPress, move all of the contents of thewordpress directory (but not the directory itself) into the root directory of your website. If you need to upload your files to your web server, rename the wordpress directory to your desired name, then use an FTPclient to upload the directory to your desired location within the root directory of your website. Go back to Step 2 and Step 3, and be sure you got all the correct database information and that it was entered correctly intowp-config.php. 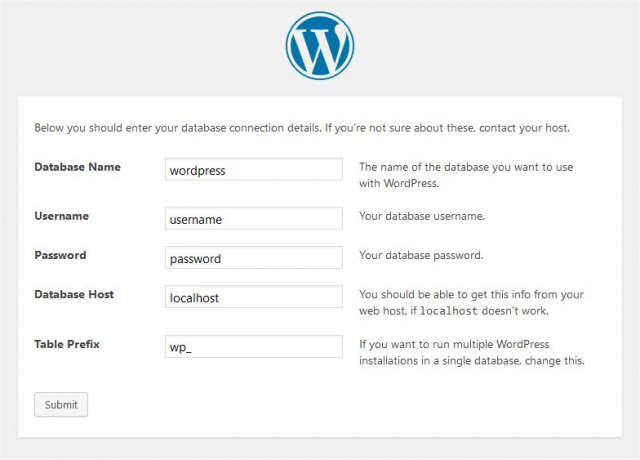 Be sure you granted your WordPress user permission to access your WordPress database in Step 3. Be sure the database server is running. The web server needs to be told to view index.php by default. In Apache, use the DirectoryIndex index.php directive. The simplest option is to create a file named .htaccess in the installed directory and place the directive there. Another option is to add the directive to the web server's configuration files. Download wp-config.php (if you don't have shell access). Check that the first line contains nothing but , and that there is no text before it (not even whitespace). If your text editor saves as Unicode, make sure it adds no byte order mark (BOM). Most Unicode-enabled text editors do not inform the user whether it adds a BOM to files; if so, try using a different text editor. My page comes out gibberish. When I look at the source I see a lot of "" tags. If the tags are being sent to the browser, it means your PHP is not working properly. All PHP code is supposed to be executed before the server sends the resulting HTML to your web browser. (That's why it's called a preprocessor.) Make sure your web server meets the requirements to run WordPress, that PHP is installed and configured properly, or contact your hosting provider or system administrator for assistance. If you are using a version of MySQL prior to 4.1, use PASSWORD instead of OLD_PASSWORD. If you do not have shell access, you should be able to simply enter the above into an SQL query in phpMyAdmin. Failing that, you may need to use your host's control panel to reset the password for your database user. My image/MP3 uploads aren't working. If you use the Rich Text Editor on a blog that's installed in a subdirectory, and drag a newly uploaded image into the editor field, the image may vanish a couple seconds later. This is due to a problem with TinyMCE (the rich text editor) not getting enough information during the drag operation to construct the path to the image or other file correctly. The solution is to NOT drag uploaded images into the editor. Instead, click and hold on the image and select "Send to Editor." Although WordPress is very easy to install, you can use one of the one-click autoinstallers typically available from hosting companies. Three of those autoinstallers, Fantastico, Installatron, and Softaculous are described here. Once you enter Fantastico on the left hand side there is a 'Blogs' Category under which WordPress is there. Click on it. Installatron is a one-click web application installer that enables WordPress and other top web applications to be instantly installed and effortlessly managed. WordPress installations managed by Installatron can updated (manually or automated), cloned, backed up and restored, edited to change installation parameters, and more. Login to your web host's control panel, navigate to "Installatron", click "WordPress", and choose the "Install this application" option. Click the "Install" button to begin the installation process. You will be redirect to a progress page where you can watch as WordPress is installed within a few seconds to your website. 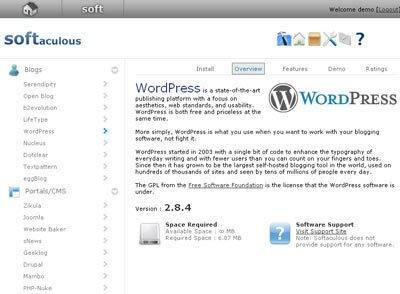 Navigate to WordPress and choose the "Install this application" option. Enter your hosting account's FTP or SSH account information, and then enter MySQL database information for a created database. For increased security, create a separate FTP account and MySQL database for your WordPress installation. Step 1. Things you need to know before starting. Web PI is a tool from Microsoft that downloads and installs the latest components you need to develop or host Web applications on Windows. Everything in the tool is free. Web PI will install and configure IIS, PHP, MySQL and anything else you may need. When Web PI launches, you will see an information page for WordPress. Start installing WordPress by pressing the "Install" button in the lower right hand corner. Configure the Database: After accepting the terms, if you need to install MySQL, you will be asked to create a password for the root account database account. Keep this password safe. WordPress will ask for this information later. 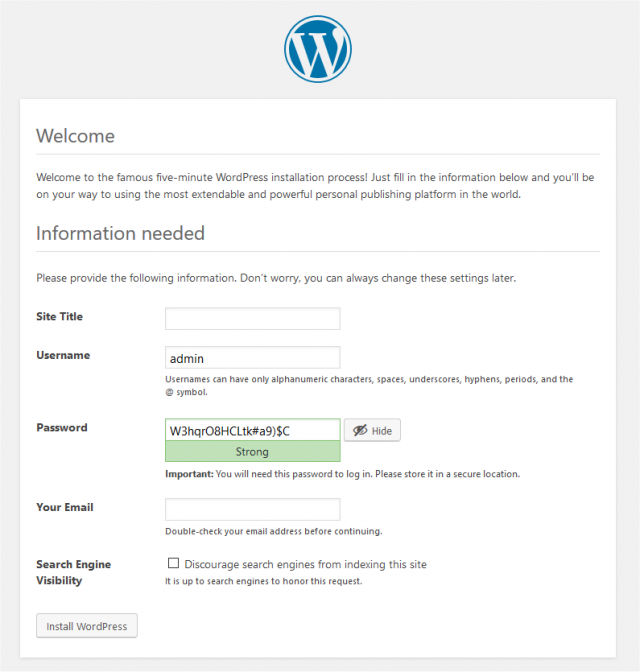 WordPress Setup: WordPress will need answers to a few specific questions such as the username (in the case of a new MySQL install is root) and password for your MySQL database to complete the install. Detailed WordPress Guide for Amazon Web Services (AWS): A step by step tutorial for installing WordPress using an Amazon Web Services (AWS) EC2 instance. Also integrates performance optimization with Apache, Varnish Cache, the W3 Total Cache plugin and Amazon's CloudFront CDN with S3. Architecting a Highly Scalable WordPress Site in AWS A guide for building a more expensive, highly scalable AWS implementation using Amazon's Relational Data Store (RDS) et al. How to Install WordPress at Digital Ocean on Ubuntu 14.04 LTS: A step by step guide to installing and configuring a Droplet with WordPress suitable for optimization with Varnish and W3 Total Cache. Because Digital Ocean uses Solid State Drives (SSD), performance with even the least expensive droplet can be quite good. Moving WordPress with the Free Duplicator Plugin A simple guide to moving WordPress to a new server using Duplicator. Migrating a WordPress blog to Amazon. A technical tutorial on moving your WordPress blog to Bitnami's AWS configuration.